ABOUT THE SHOP – Liberty Machine Inc.
Liberty Machine is currently focusing on work that is suitable for our two VMC’s; Kitamura-3xd and DMG Mori Duravertical 5100 w/4th axis. We typically do work from 50-1000 pieces at a time, but always interested in expanding that role to include long term production, up to and including “lights out” robotic tended machining. We are currently housed in a small 900 sq/ft garage. The shop is situated on a large parcel of land with ample room for future expansion. For CAD/CAM software, we run Fusion 360 Ultimate. This software is capable of full 3 axis programming, including surfacing, mill/turn, as well as 5 axis programming. Fusion is a fully integrated CAD/CAM package, so solid modeling is built right into it. Fusion also has translators included for over 20 major file formats, so integration into our software is no issue. Do it right or do it twice. Quality. Everyone boasts about quality. Why wouldn’t you? No one wants to say they make junk. But quality goes above just “meeting the print”. Quality starts in the job processing, carries over into stock cutting, handling, machining, deburring, inspection, and finally packaging and shipping. We take absolute pride in everything we do and it shows at every level. Every job that goes to the machine has a setup sheet to convey as much information as is possible. Operator error and setup time is greatly reduced because of this. Every job that is run undergoes a documented 100% first article inspection. In-Process inspection is then carried out at pre-determined intervals. As frequent as 100% of parts, up to 1 in 20, depending on CUSTOMER (not our) requirements. Customer requirements always come first at Liberty Machine. We only invest in the best the industry has to offer. Starrett, Brown and Sharpe, Mitutoyo. We do not buy knock-off inspection equipment, regardless of cost savings. Our hand gages are internally calibrated, but our larger items, such as the CMM, Height Gage and Comparator will be calibrated by a third party that is certified in this field. Seth, the owner and lead machinist of Liberty Machine Shop, has 18 years in the machining industry and manages the shop. He started working for a small shop, right out of high-school. Pushing brooms, running saws, making deliveries. Ambition and desire to learn and grow in the industry eventually led him into a few shops over his career, always with the goal of absorbing more knowledge and skills. The last 8 years were spent at Maine’s premier aerospace and defense machine shop. It was here that Seth was really able to grow and push himself into very challenging areas such as Multi-Axis machines (4-9 axis), innovative workholding concepts, precision inspection methods, machining of high temp alloys such as stainless steel, titanium, Inconel, K-Monel. 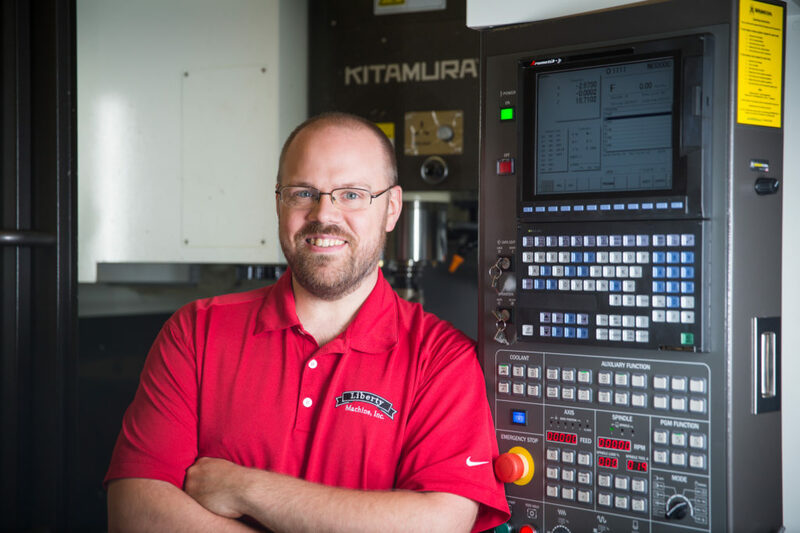 With this experience under his belt, Seth is able to provide solid solutions to machining challenges.